I’m thrilled to be teaming up with the lovely people at WITHIN to offer this stunning Gisele Tray Table worth £225 as today’s giveaway prize. If you’re looking for a new addition to your living room, dining space, bedroom or open plan kitchen/diner, then the Gisele Tray Table is the perfect piece. With its removable tray table and deep drawer, the Gisele really does tick all of the boxes. 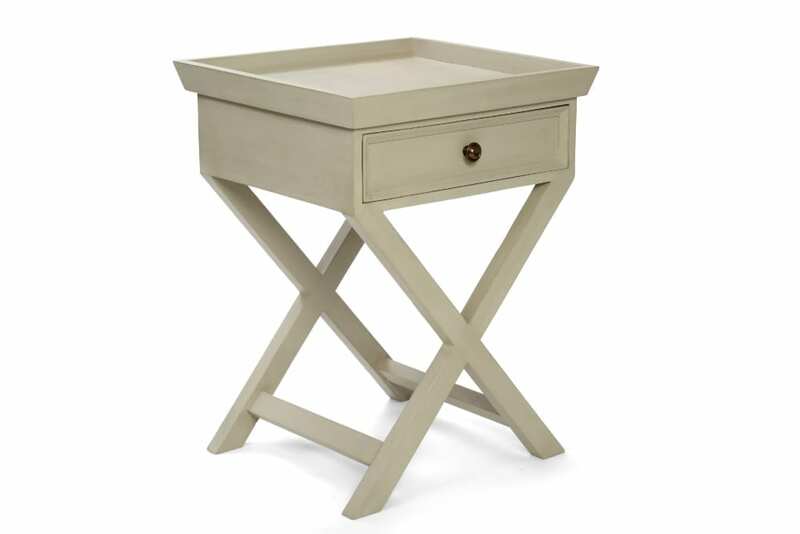 This leggy table is hand-carved from solid hardwood which has been painted in a French grey/green – a sophisticated and subtle colour that will work with most decorating schemes. If you’ve not come across WITHIN before, it’s the brainchild of home guru Alison Cork, who has built up a formidable reputation as a trusted homes and interiors expert, with an unfailing eye for quality and value. In 2013, Alison launched her own interiors collection online; “Alison at Home”, featuring beautiful, stylish home ware at prices significantly below the high street. After a hugely successful debut, Alison at Home was rebranded as WITHIN in the Spring of 2015. Alison’s signature style is classic design with a twist, and her work blends elegant shapes with tactile materials and subtle use of colour. There is a hint of tradition and heritage at the heart of all Alison’s work, but her contemporary treatment allows it to sit successfully in the modern home. This style has been carried through into the DNA of the WITHIN brand, and is evident in every piece that the WITHIN team now develops. Passionate about what Britain does best, Alison and WITHIN also work alongside skilled craftspeople and suppliers throughout the UK, to support British manufacturing. If you’d like to be in with a chance of winning this stylish piece of furniture, simply follow the instructions in the rafflecopter widget below, tweeting the message, and following WITHIN on Twitter. There are a few extra entries too, which are all optional, but will increase your chances of winning. I would place this lovely table in the lounge. I’ve just been having a good look around WITHIN’s web page. Wow, their furniture is beautiful. Keeping my fingers crossed now to win the lottery, so that I can refurbish our home with them. I’m entering competitions for my sister at the moment who has just had the all clear from cancer. Her husband bought her a summer house to relax in during her treatment and this little table would be perfect for her to rest her drink on and her favourite novels. In my hallway, get to show if off as people come in. would look lovely in my living room. I’d love to put it in my new sun room, right next to my big comfy chair. In my hallway I think, or maybe at the top of the stairs. Although hallway is winning at the moment! I would put it in my lounge where it would look fabulous. It’d look great in my study! I would keep this lovely table in the master bedroom. Great for the side of my bed and I could even have breakfast in bed. In our living room, so we could light it gently in the evenings! I’m re-vamping my spare bedroom and this lovely table would look great there. I will put it in my bedroom. I would put it in my hallway. This would be great as the focal point of my new bedroom/sitting room beautiful, practical and useful. In our hallway, we have the perfect space for it. I would love it in the guest bedroom. I’d put it in the dining room, which is close to the kitchen. I would put it in my livingroom. Id put it in my bedroom. in my large hallway for every visitor to see. This would look great in my bedroom!! I would put in my bedroom, I have the perfect corner for it. I’d put it in my hallway. I would put it in my hallway . This would be perfect by the side of MY seat on the sofa. We’d have this in the lounge and I think it would get loads of use! That is lovely, if I won I’d put in my dinning room. i would put it in my hallway, would look fantastic. I have a little space under the TV in the lounge. I would have this on my landing – it’s gorgeous! I’ve just had my basement converted and am having a ‘quiet space’, so this would be lovely down there. It would look amazing in my newly decorated bedroom! I think I would have it in the upper landing. It is absolutely beautiful. in downstairs hallway – would look lovely! definately the bedroom ….love it!!!! In the lounge/dining/kitchen area, it would look fantastic. I would put it in the hallway where everyone could see it. I would put this lovely table in my hallway with a nice lamp on it so that everyone can see it when they enter the house. In a corner of the living room to add some quirky interest! Hi I’m assuming the question about the lamp refers to the last giveaway. 🙂 Despite the tray being a bit more at home downstairs maybe this would actually look great by my bed. Perfect for my reading nook! I would loving place it in my living room. Love this table, very stylish but very practical – BINGO! I would love to put them in conservatory. I would love it in my front room next to my reading chair. The light would be perfect for me to read and do art work. Plus I’d see it all the time. It would look stunning in the Conservatory and very easy to move to the Terrace in good weather !! I would put it in my extension. I would have this table in the hallway! We are currently redecorating our lounge and I think it would be perfect for my new side table! It would add a beautiful finishing touch to my bedroom. This wold match my colour palette perfectly in my living room and would be really functional as well. It would look lovely in the living room. I am moving soon but I would put it in my bedroom reading for the dark nights! I’d put it in my hall. There is a hole in our lounge where this would look great! I’d love it in my lounge where I could se it every day and admire it! Nice design. It will perfectly fit in my living room with some of beautiful pots of flower.